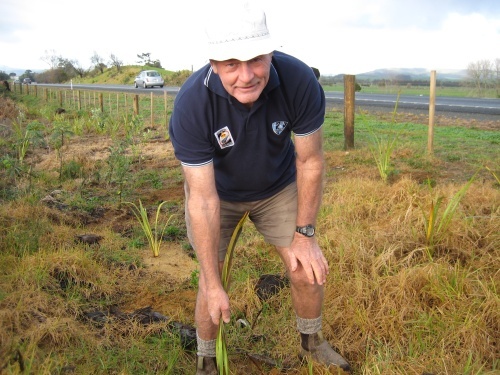 Living Legends volunteers and Northland Rugby Legend Richie Guy helped to plant over 10,000 native trees at the Uretiti Rest Area – which is located on State Highway 1 and forms part of the Bream Bay Coastal Reserve. The area that Living Legends has worked on is adjacent to the DOC campground and was formerly a weed infested waste land. 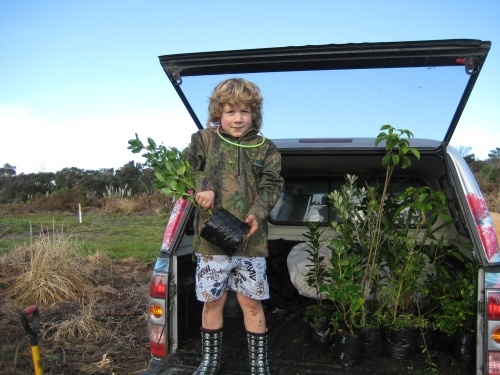 It is hoped the dense cover of over 10,600 plants from the Living Legends project over the past three years will eventually suppress the weeds. Living Legends will continue to oversee the maintenance of this planting project in conjunction with the Department of Conservation, who will care for it for years to come. Richie Guy’s considerable feats as a player have been a little overshadowed by his prominence as a rugby administrator in later years. But despite a late start as a representative, Richie Guy was a leading player for many years with a flair for scoring tries. Richie made the North Auckland (now Northland) side in 1966 when he was 25. By the time he retired in 1974 he had played 91 matches for the union, including the 1971 Ranfurly Shield win over Auckland, the game he says was one of his greatest rugby memories. In 1971 Richie trialled for the All Blacks and won a place in the series against the touring British Lions, playing in all four tests. Though his 109-match first class career concluded in 1974 Richie continued playing for his Waipu club and it was from there he began an illustrious administrative record. By 1981 he was chairman of the North Auckland union. He then joined the New Zealand Rugby Union council in 1984 and in 1995-96 he was chairman, continuing that role when a board was introduced until 1997. In his early years on the NZRU council Guy acted as the All Black manager. He took the touring team to France in 1986 after earlier that year managing the Baby Blacks. In 1987 he was manager of the side which won the inaugural Rugby World Cup. As chairman he faced many major challenges including the shift to professionalism and for a time the possible loss of leading players to the rebel World Rugby Corporation. Richie’s greatest feeling of satisfaction came with his negotiating the SANZAR agreement. SANZAR (South Africa, New Zealand and Australia Rugby) is the body which operates Super Rugby and Tri Nations competitions. It is a joint venture of the South African Rugby Union, the New Zealand Rugby Union and the Australian Rugby Union, and was formed in 1996. This work substantially changed the rugby laws after that. “There was the ability to be part of a group who could influence the game on a worldwide scale” says Richie. He’s humbled to have been selected as Northland’s Rugby Legend. “It’s a great honour, but also a little bit embarrassing!” says Richie.